Before the turn of the 19th century, Baku was already known for its oil. Europeans gravitated to this city on the shores of the Caspian, and together with local entrepreneurs, they succeeded in producing more than 51 percent of the world's supply of oil. At about the same time, America was giving birth to a new musical form-jazz. This mesmerizing new sound which originated in the restaurants and back alleys of New Orleans and Chicago drew upon many different cultural traditions, including African rhythms, Asian improvisations and abstract thinking, European classical music and even symbols borrowed from Native American tribes. Soon afterwards, this new musical synthesis found its way to other cities all over the world, including Baku. Newspaper archives indicate that bands were performing jazz in Baku restaurants. It's very possible that Robert Nobel and his brothers, Ludwig and Alfred, listened to jazz in Baku. Unfortunately, there are no early recordings to determine the professional quality of these performances. But an ironic twist of fate brought this economic boom to an abrupt stop. In 1920, the Soviet regime gained control of the region, and soon Soviet doctrine profoundly affected all aspects of life-even attitudes toward art, literature and emotions. Everything was subject to Communist ideology and central control. Nothing escaped its scrutiny, not even music - including what to sing, what to play and what to listen to. These decisions were all made in the Kremlin in Moscow - not by local artists. But in 1945 at the end of what the Soviets call the "Great Patriotic War" (World War II), Stalin decided to prohibit jazz throughout the Soviet Union, by labeling it "music of the capitalists." Jazz had already been banned by Hitler in Germany in 1933 on the grounds that it was "the music of blacks." 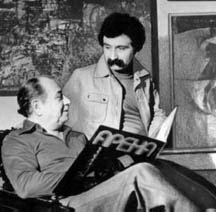 Left: Two of Azerbaijan's great jazz pianists - Tofig Guliyev (seated) with Vagif Mustafazade. Consequently, between 1945 and Stalin's death in 1953, not only jazz, but even music played on the saxophone was prohibited. It's a fact that during that period, the saxophone solo in Ravel's famous "Bolero" was played on bassoon. Such a ban could have been expected. Totalitarian regimes always seem to be suspicious of artistic forms that are based on egalitarian improvisation. Even today, jazz is usually not sanctioned in countries ruled by dictatorial regimes. Despite these prohibitions, by the 1950s, a new jazz movement began to emerge in Azerbaijan which came to be known as "jazz mugam" or "mugam jazz" (whichever term you prefer). Its origins were in Baku; its brain child, Vagif Mustafazade. Vagif was born in 1940 in a difficult period when our country did not wear the smile of jazz on its face. But he went on to become a shining star in the darkness and developed into an extraordinarily great jazzman, pianist and composer. Actually, I can't quite remember the first time I met Vagif. It seems I've always known him. It must have been in my early years at school. He was a year younger than me. Later I discovered that his name, as well as mine, had been chosen by my father, Samad Vurgun, the renowned poet. His mother had asked my father to suggest the name. "Vagif" is an Arabic word that means "extremely knowledgeable." The truth is that Vagif Mustafazade, himself, could have become a poet. Not many people knew his verbal acuity. My family is fond of reminiscing about the time when Vagif was only three years old and recited from memory a section from my father's play, "Farhad and Shirin." He had only heard the work once. Left: Lala Mustafazade, classical pianist. I well remember the days when Vagif and I used to gather with friends near Maiden's Tower or in Sabir Park and recite "meykhana" (pronounced MEY-kha-na). "Meykhana" is a kind of rhythmic poetry, somewhat like contemporary "rap" in the West. It's a pity that none of those pieces were ever recorded. As might have been expected, "meykhanas" were also prohibited in Soviet Azerbaijan, simply because improvised forms of poetry could not be controlled and censored. They were considered too volatile. The totalitarian regime branded it as "hooligan poetry." Well, it seems Vagif and I were among the "great hooligans." Vagif lived on a second-floor apartment in Ichari Shahar (the Inner City), which has since been converted into the Vagif Mustafazade Home Museum and can be visited today. The building was constructed during the oil boom, but after the Soviets came, this place, like hundreds of others, was savagely divided into small apartments. The Mustafazades-Vagif and his mom, Ziver Khanum (Mrs. Ziver)-were assigned one small room which served as both bedroom and living room. Fortunately, it was bright and bathed in sunlight. They shared a kitchen and bathroom with other occupants in the building. Despite the impoverished setting, that single one-room apartment became a repository of an immense musical knowledge and in shaping the movement of jazz in Azerbaijan. I have so many fond memories of times spent together there, including the endless hours we used to listen secretly to the short wave radio programs of BBC just to catch some of the jazz they broadcast. Neither of us knew English. Afterwards, we would try to reproduce the music that we had heard on the old piano in the apartment. Radio BBC was our only exposure to jazz at the time. Despite the fact that I had studied music my entire life, it wasn't until the mid-1950s that I first laid eyes on a jazz score. The only thing we could do was to listen at every chance we got, and then try to imitate the sounds that we heard. We didn't have access to personal tape recorders in those days. Vagif was especially adept. He had an incredible ear for music. For example, once his piano teacher asked him to learn Rachmaninoff's "Prelude in C-Sharp Minor." But he didn't have access to the score, so he listened to the record several times and that's how he learned to perform it. On occasion, we would hear jazz excerpts at the movies. You could always tell whenever an American spy was about to appear in a scene in a Soviet movie. His entrance was signaled by jazz. After World War II, we had access to a few American movies. Some had jazz on their soundtracks. Vagif and I used to watch these films at the cinema over and over again, sometimes 20-30 times. We would wait for the sections that had jazz, then rush back home to try to reproduce them while they were still fresh in our minds. I remember that "Sad Baby," a song in the film, "The Fate of an American Soldier," always used to make us cry. After Stalin's death in 1953, the prohibition against jazz was gradually lifted. Still, the public was highly suspicious. As could have been expected, the situation didn't change overnight. For example in 1957, Vagif was scheduled to give a concert at Music School #1, where his mother taught piano. His program included two or three short jazz compositions. But the concert was never allowed to take place because the music was branded as "capitalist." Therefore, Vagif and other musicians involved with jazz, mainly performed in clubs and each others' homes. Classical jazz, including dance music and "blues," formed the basis of Vagif's repertoire. Early on, he created some magnificent renditions of the Fox Trot, the Charleston and the One-Step, as well as some memorable pieces from Glenn Miller's "Serenade of the Sunny Valley." After that, B-Bop came along. However, Vagif always had an affinity for improvisational jazz. He didn't really understand why, but he began living with this love and obsession. It was a mystery to him why he was so attracted to it. In 1958, he was selected as pianist for the Folk Instruments Orchestra, and they performed several concerts at the Philharmonic together. He continued to play dance jazz in clubs, but it was clear that he was not comfortable. He was in search of something else. He was unsettled and this quest tortured him morally, sometimes, even physically. The fact that he couldn't expose his inner world openly to his audience and that he was deprived of sharing his feelings with people freelygnawed at him. That's when he started drinking and getting involved with drugs. The words of his critics didn't help any either. Their opinions often contradicted one other. Sometimes they praised him; other times, they brutally criticized him. Eventually, Vagif created a new sound-his own kind of jazz-a fusion of jazz with a form of music indigenous to Azerbaijan-the mugam. Essentially, Vagif Mustafazade's jazz was the first to be built upon the native music of the East. Such a trend was not new. Azerbaijan was used to being "first" when it came to music in the Muslim East. For example, Azerbaijan lays claim to the first opera, the first female opera singer, the first ballet and the first symphony orchestra. Mugam jazz is jazz based on the modal forms or scales of mugams, just as a mugam symphonies are symphonies based on mugams. Ordinary jazz is marked by metered rhythm. But mugam jazz does not follow a metered system. Both rhythm and scales are improvised. By the beginning of the early 1960s, Vagif was gaining recognition outside of Azerbaijan as a jazz musician. In 1966, Willis Conover, conductor of the "Jazz Time" radio program, announced, "Vagif Mustafazade is an extraordinary pianist. It is impossible to identify his equal. He is the most lyrical pianist I have ever known." That year, Conover came to the Jazz Festival in Tallinn, Estonia, after visiting several European countries. He expressed his disappointment with the American jazz he had heard there and complained that "no one can play American jazz like Americans do." When the participants heard this, most of them changed their programs and concentrated more on their own "national" pieces. Everybody expected Vagif to do the same and play one of his mugam-jazz arrangements. But instead, he challenged Conover and surprised everyone by playing Gershwin's "The Man I Love." As he finished the piece, Conover stood, applauding and shouting "Bravo!" Vagif had proved that he could play American jazz, as well as, and possibly even better than, most Americans. He took first place at the festival. Despite this worldwide recognition, Vagif still had trouble finding support at home. Some of his friends, including myself, who taught at the Music Conservatory (now known as the Music Academy), were unable to secure a position for him there. Decision makers always complained that he was too involved with jazz. It wasn't until 1964 that he acquired a position, thanks to the efforts of Rafig Guliyev and Zohrab Adigozalzade, who both taught there. Then Vagif left for the Republic of Georgia where he organized the famous "Orera" group and helped train famous musicians such as Tomaz Kurashvili. It was also in Georgia that he met a young woman, Elsa, whom he later married. 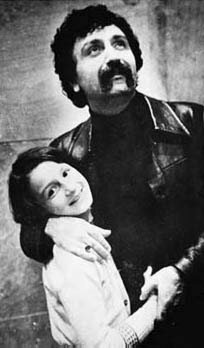 Vagif already had a daughter by his first marriage by the name of Laleh who would grow up to become an extraordinarily talented classical pianist and would win the Grand Prize for Piano in Epinal, France, in 1991. Then a daughter was born to Elsa, and they named her, Aziza. Now in her late 20s, she has became one of the stars of jazz music, just like her father was. In 1978 Vagif took first place for his performance of "Waiting for Aziza," at the 8th International Jazz Festival in Monaco. Other jazz pianists had a great respect for Mustafazade. Once, when Vagif was playing in the Iveriya Hotel in Tbilisi, the famous American jazz pianist and master of blues, B. B. King, heard him and remarked, "Mr. Mustafazade, they call me the 'King of the Blues,' but I sure wish I could play the blues as well as you do." Vagif's death was a shock to many people. He was only 39 years old when he died on stage while performing in Tashkent (Uzbekistan) in December 1979. Somehow the tragedy came as no surprise to me. I had, somehow, anticipated it. Every time I used to see him at the piano, I realized that he was as taut as a string. I knew that he would not be able to survive music for very long. Three months later, on March 16, 1980, I helped to organize a Memorial Night at the Actors' House devoted to his memory. So many people came to pay tribute that we had to set up loudspeakers in the lobby and in the street. There just wasn't enough room in the hall. A few days later Conover devoted his 45-minute radio program entirely to Vagif. Vagif's mother spent the last years of her life officially seeking permission to convert their apartment into a home museum in honor of her son. She managed to remodel the area and gain access for the museum to two additional rooms adjacent to the original quarters where they had once lived. The Vagif Mustafazade Home Museum was opened on March 1, 1988, eight years after Vagif's death. Eight years later, in January 1996, Ziver Khanum, too, also passed on. The museum is open to the public-this apartment where Vagif, I and others spent so many intense, pleasurable hours and days straining to hear Radio BBC and experimenting and improvising on the piano. It's a very simple museum. Lots of photos are on the walls. The piano is still there in the main room, as is the old wooden box radio. It's amazing how those jazz programs that we listened to some 30-40 years ago were able to penetrate the stubborn walls of totalitarianism, and how the sound that eventually emerged still affects how jazz is played in Azerbaijan today. Vagif Samadoglu, the author of this article, is the son of the famous poet Samad Vurgun. He studied classical music professionally and graduated from the Academy of Music and graduate studies at the Moscow Conservatory. He won the 1962 Music Festival in Baku. He now devotes all his time to writing poetry. His most recent book,"Man vurdayam" (I Am Here), was published in Baku in 1996 (Azeri Cyrillic). See AI 4.1, Spring 1996, for Vagif's article about his father, Samad Vurgun. Vagif Mustafazade's Home Museum is located in the Inner City (Ichari Shahar) at Duksovski Corner, Vagif Mustafazade Corner 4. Tel: (99-412) 92-17-92.